So what’s this about? Astronomers think they will be able to “see” a supermassive black hole in a galaxy 55 million light years away? Surely that isn’t possible. Actually, it might be. Back in June, I reported that radio astronomers may be able to use a future network of radio antennae as part of a very long baseline interferometry (VLBI) campaign. With enough observatories, we may be able to resolve the event horizon of the supermassive black hole lurking at the centre of the Milky Way, some 26,000 light years away from the Solar System. The most exciting thing is that existing sub-millimeter observations of Sgr. A* (the radio source at the centre of our galaxy where the 4 million solar mass black hole lives) suggest there is some kind of active structure surrounding the black hole’s event horizon. If this is the case, a modest 7-antennae VLBI could observe dynamic flares as matter falls into the event horizon. It would be a phenomenal scientific achievement to see a flare-up after a star is eaten by Sgr. A*, or to see the rotation of a possibly spinning black hole event horizon. All of this may be a possibility, and through a combination of Sgr. A*’s mass and relatively close proximity to Earth, our galaxy’s supermassive black hole is predicted to have the largest apparent event horizon in the sky. As it turns out, there could be another challenger to Sgr. A*’s “largest apparent event horizon” crown. Sitting in the centre of the active galaxy called M87, 55 million light years away (that’s over 2,000 times further away than Sgr. A*), is a black hole behemoth. M87’s supermassive black hole consumes vast amounts of matter, spewing jets of gas 5,000 light years from the core of the giant elliptical galaxy. And until now, astronomers have underestimated the size of this monster. Karl Gebhardt (Univ. of Texas at Austin) and Thomas Jens (Max Planck Institute for Extraterrestrial Physics in Garching, Germany) took another look at M87 and weighed the galaxy by sifting through observational data with a supercomputer model. This new model accounted for the theorized halo of invisible dark matter surrounding M87. This analysis yielded a shocking result; the central supermassive black hole should have a mass of 6.4 billion Suns, double the mass of previous estimates. Therefore, the M87 black hole is around 1,600 times more massive than our galaxy’s supermassive black hole. A Measure for Dark Matter? Now that the M87 black hole is much bigger than previously thought, there’s the tantalizing possibility of using the proposed VLBI to image M87’s black hole as well as Sgr. A*, as they should both have comparable event horizon dimensions when viewed from Earth. Oh yes, this should be good. Publication: The Black Hole Mass, Stellar Mass-to-Light Ratio, and Dark Matter Halo in M87, Karl Gebhardt et al 2009 ApJ 700 1690-1701, doi: 10.1088/0004-637X/700/2/1690. The Event Horizon Telescope: Are We Close to Imaging a Black Hole? All the evidence suggests there is a supermassive black hole lurking in the centre of our galaxy. We’ve known as much for quite some time, but it wasn’t until recently that we’ve been able to confirm it. As it turns out, most galactic nuclei are predicted to contain supermassive black holes in their cores. The Milky Way’s supermassive black hole is called Sagittarius A*, a well-known compact radio source used by radio astronomers as an instrumental calibration target. The black hole driving this emission has been calculated to weigh in at a whopping 4×106 solar masses. So, we’re certain Sgr A* is a supermassive black hole, how can we use it? Using our Sun as an example, stellar physicists use the Sun as an up-close laboratory so they can better understand stars located many light years away. It is an up-close star that we can study in great detail, gleaning all kinds of information, helping us learn more about how stars work in general. What if Sgr A* could be used in a similar way, not in the study of stellar physics, but in the pursuit to understand the dynamics of black holes throughout the Universe? Due to its proximity at ~ 8 kpc [26,000 ly], Sgr A* has the largest apparent event horizon of any known black hole candidate. In other words, the supermassive black hole in the centre of the galaxy is the largest observable black hole in the sky. As Sgr A* is so massive, its event horizon is therefore bigger, providing a sizeable target for Earth-based observatories to resolve. Although the black hole is quite a distance from us, the size of its event horizon more than makes up for its location, it even trumps closer, less massive stellar black holes. Sgr A* could therefore be our own personal black hole laboratory that we can study from Earth. But there’s a catch: How do you directly observe a black hole that’s 26,000 light years away? Firstly, you need an array of telescopes, and the array of telescopes need to have very large baselines (i.e. the ‘scopes need to be spread apart as wide as possible). This means you would need an international array of collaborating observatories to make this happen. The authors model some possible results using many observatories as part of a long baseline interferometry (VLBI) campaign. As Sgr A*’s emissions peak in the millimetre wavelengths, a VLBI system observing in millimetre wavelengths could spot a resolved black hole shadow in the heart of Sg. A*. They also say that existing millimetre observations of Sgr A* show emission emanating from a compact region offset from the centre of the black hole, indicating there is some kind of structure surrounding the black hole. The results of their models are striking. As can be seen in the three images at the top of this post, a definite black hole shadow could be observed with just 7 observatories working together. With 13 observatories, the resolution improves vastly. Could we be on the verge of tracking real-time flaring events occurring near the black hole? Perhaps we’ll soon be able to observe the rotation of the supermassive black hole as well as accretion disk dynamics. If this is the case, we may be able to also witness the extreme relativistic effects predicted to be acting on the volume of space surrounding Sgr A*. Author Ian O'NeillPosted on June 23, 2009 April 9, 2019 Categories Black Holes, Featured Articles, RelativityTags Black hole, Event horizon, Milky Way, Sag. 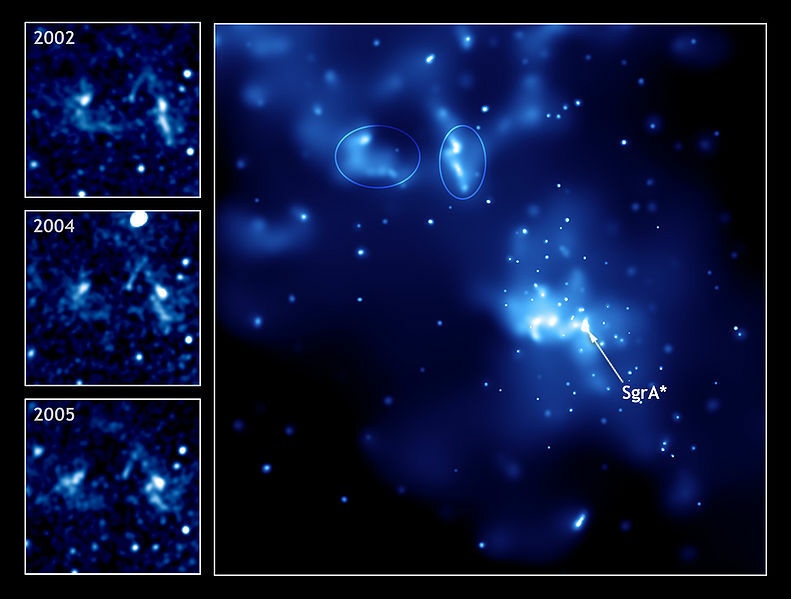 A*, Sagittarius A*, Sgr A*, VLBI15 Comments on The Event Horizon Telescope: Are We Close to Imaging a Black Hole? Is the Universe a Holographic Projection? Could our cosmos be a projection from the edge of the observable Universe? Author Ian O'NeillPosted on January 20, 2009 Categories Coolness, Gravitational Waves, Quantum Mechanics, RelativityTags Black Holes, Brain strain, Coolness, Event horizon, Fabric of the Universe, Featured, GEO800, Gravitational Waves, Hologram, LIGO, Space-time, Wow22 Comments on Is the Universe a Holographic Projection? You can manipulate a black hole as much as you like but you’ll never get rid of its event horizon, a new study suggests. This may sound a little odd, the event horizon is what makes the black hole, well… black. However, in the centre of a black hole, hidden deep inside the event horizon, is a singularity. A singularity is a mathematical consequence, it is also a point in space where the laws of physics do not apply. Mathematics also predicts that singularities can exist without an associated event horizon, but this means that we’d be able to physically see a black hole’s singularity. This theoretical entity is known as a “naked singularity” and physicists are at a loss to explain what one would look like.